Rover V8 engines from c.1976 onwards. 90/110 Defender, 2.25 Petrol engine. 90/110 Defender, 2.5 Petrol engine. 90/110 Defender, 2.5 NA Diesel engine. 90/110 Defender, 2.5 Diesel Turbo engine. 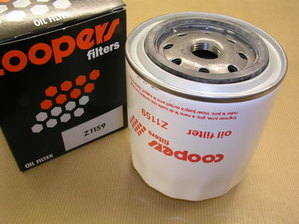 Also suitable for Series 2a and Series 3, 2¼ Petrol and 2¼ Diesel engines converted to 'spin-on' type oil filter. OE manufacturer may vary from that pictured. Current stock is Mahle manufactured.